Issued on 19 October 2010. Features the Knippelsbro (Knippel's Bridge) of 1937 and the Langstrup Belt Plate from the early Bronze Age, approximately 1400 BC. 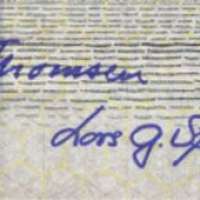 Signaturers have been identified as Jens Thomesen (Governor) and Lars Gerrild Sørensen (Head of Banking Services). 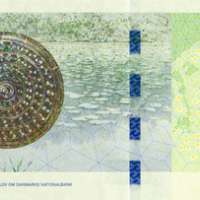 The process of designing the 'Bridge' banknotes was initiated in 2006 by the Danish National Bank. The theme of the new banknotes is Danish bridges and the surrounding landscapes, or details from these landscapes. The artist Karin Birgitte Lund has chosen to interpret this theme in two ways: bridges as links between various parts of Denmark and as links between the past and the present. The present is represented by the bridges, the past by five distinctive prehistoric objects found near the bridges. Among the new security features is a window thread with a moving wave pattern. Another feature is a new, sophisticated hologram that reflects light in different colors. The new banknotes also have the traditional security features such as the watermark and the hidden security thread. The banknotes are printed on dirt-resistant cotton paper that is much stronger than normal writing paper. The paper is incorporated into the surface called Anti Soil Treatment. The paper is delivered to Danmarks Nationalbank's Banknote Printing Works complete with watermark and hidden security thread. The current banknotes are of the same size as the previous banknotes. All the banknotes are of the same height, but with each increase in denomination, the banknotes gain 10 mm in length. The 50-krone banknote therefore measures 125 mm x 72 mm, whereas the 1,000-krone banknote measures 165 mm x 72 mm. The note is in extremely fine condition, mark from calculating machine on middle-top and some sign of very light use, not crispy.